McGrath’s Service Center offers a wide range of automotive HVAC repair services at our West Milton, Union Township auto repair shop. The heating, ventilation, and air conditioning (HVAC) system in your car or truck is designed to maintain a comfortable environment in the vehicle’s interior when driving in and around West Milton and Union Township and provides the safety feature of defrosting your windows when operating your vehicle in difficult driving conditions. heater core. The temperature in the auto interior is regulated by controlling the coolant flow and/or by mixing colder air from outside the vehicle. 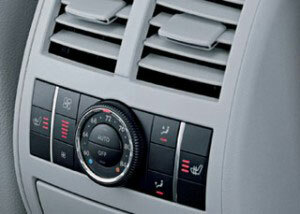 Automatic or manual controls are then used to adjust the temperature and air flow inside the car. The auto air conditioning system works in a very similar manner to those that cool homes and other buildings. A gas – such as freon – is placed into a system that is sealed. The gas is then heated as a result of being pressurized by a compressor. Once pressurized the heated gas then travels to the condenser where it gives off its heat to a flow of cool air and condenses to a liquid. This liquid is then transported to the receiver-dryer tank where the excess fluid is stored and any water removed. The liquid in the receiver-dryer tank then flows to the expansion valve which meters it into the air conditioning system’s expansion valve inside the car. The cool, high pressure liquid then expands into a cold, low pressure gas. This evaporation process is what ultimately provides the passengers in the vehicle with a cool flow of air during the hot summer months in the Miami Valley.